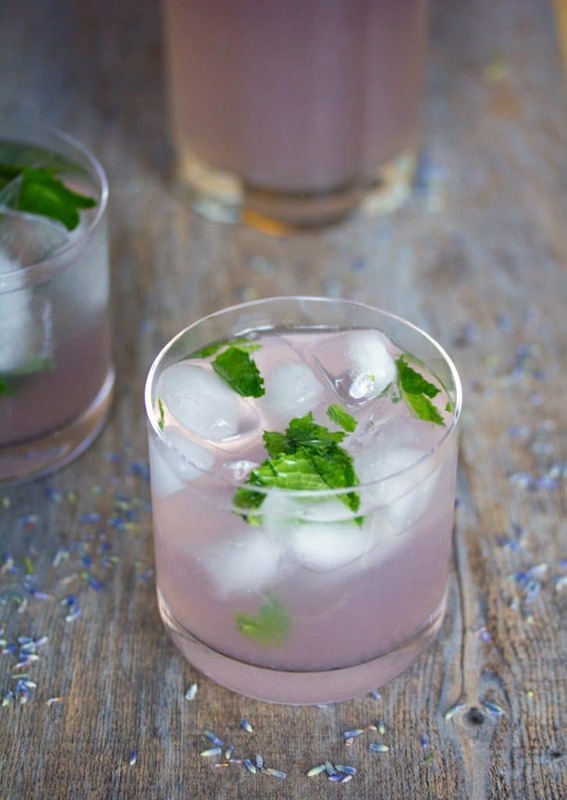 Made with a lavender simple syrup and homemade lemonade muddled with mint, these Lavender Lemonade Mojitos are the prettiest color and make for the perfect summer cocktail. It’s likely that I’m currently on a boat on Lake Chautauqua or sitting by the pool catching some much-needed sun. And maybe, just maybe I’m also sipping on this cocktail. Because when I made it, I also whipped up some extra lavender simple syrup to bring with me on vacation. It’s a part of my whole vacation cocktail strategy, which is almost as important as making sure you’ve packed enough underwear and the proper footwear. Maybe even more important because if you have a vacation cocktail strategy, you might not even care about not having enough underwear or the proper footwear with you. Pack a couple simple syrups in a cooler, have a few good cocktail recipes in mind, and you’re basically vacation ready. I’ve been wanting to cook, bake, and cocktail with lavender for a long time now. Mainly because it’s purple. But also because it’s deliciously tasty. I finally “splurged” on a 1/2 pound of dried lavender from Amazon.com. It was only $11. And was A LOT of lavender. So, I mean, you should probably expect to see a lot of lavender recipes here in the coming days. I think macarons may be up very very soon. In case you’re interested, lavender actually has many health benefits… It helps you relax, it can beat bloating, and it can reduce itchiness. So, basically, this cocktail could make you feel like a million dollars. Worth a shot, right? I’ve seen lavender cocktails all over the internet, which is partly why I couldn’t help myself from purchasing some lavender for my own use. The herb goes naturally with lemon, but I decided to add some rum and mint and make a mojito out of it. 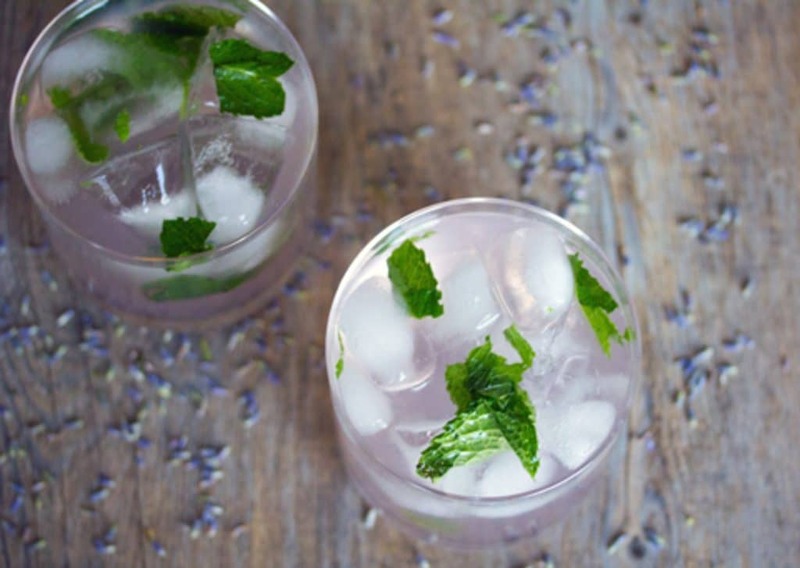 Because when life gives you lavender, you make lavender lemonade. And then you make a mojito out of it. Always make a mojito. Or a cocktail of some kind. Pretty, right? 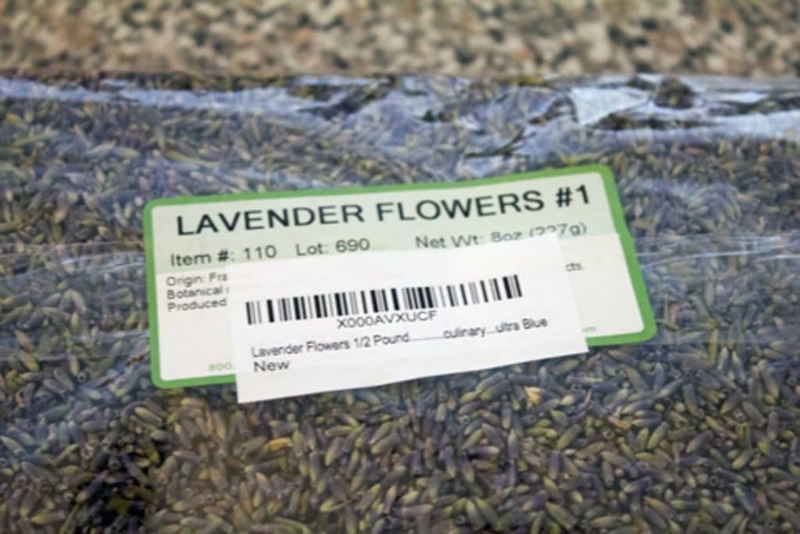 If you’re buying lavender, make sure it’s for culinary use. You could also use it for scented sachets or simply to make your home smell nice. I want to put a little bit by my bedside to help relax me at night. You’ll want to start by making the simple syrup. You know I love simple syrup, but this lavender simple syrup takes things to a whole new level. 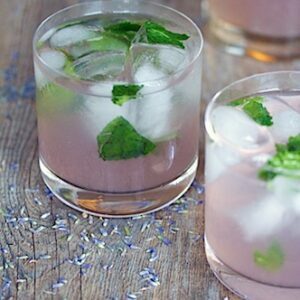 This recipe makes a nice full pitcher of lavender lemonade mojitos, so you may as well invite a friend over. Pour the cocktail into ice-filled glasses. And sip away. 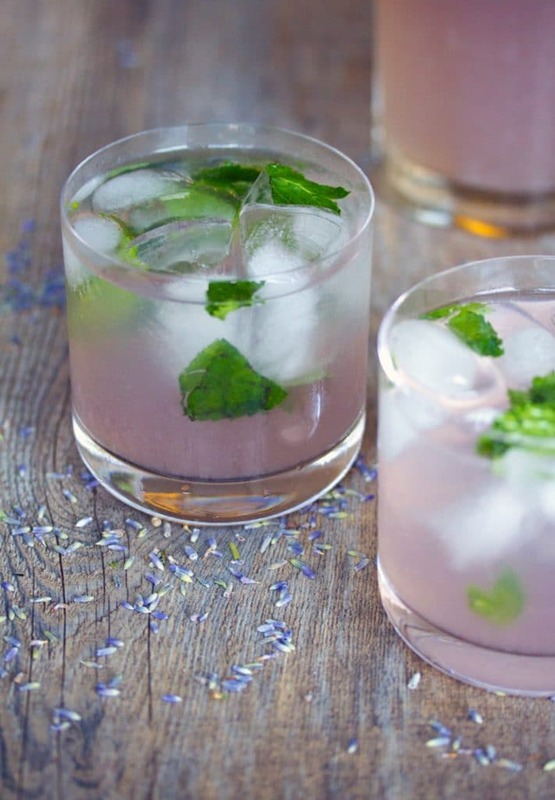 I’m pretty sure this lavender lemonade cocktail is the ideal vacation sipper. But I also kind of think it would be perfect to sip on before bed. The combination of the lavender and rum will most definitely help you feel all nice and relaxed until you fall asleep. Not to mention, you’ll be getting your fair share of vitamin C.
Is there anything quite like freshly squeezed lemonade? Well, yes. 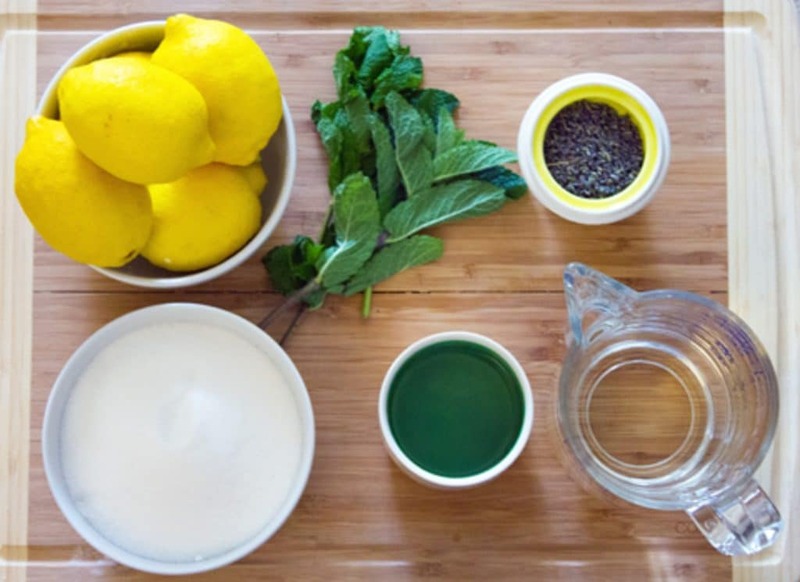 Freshly squeezed lemonade with lavender simple syrup and lots of mint. 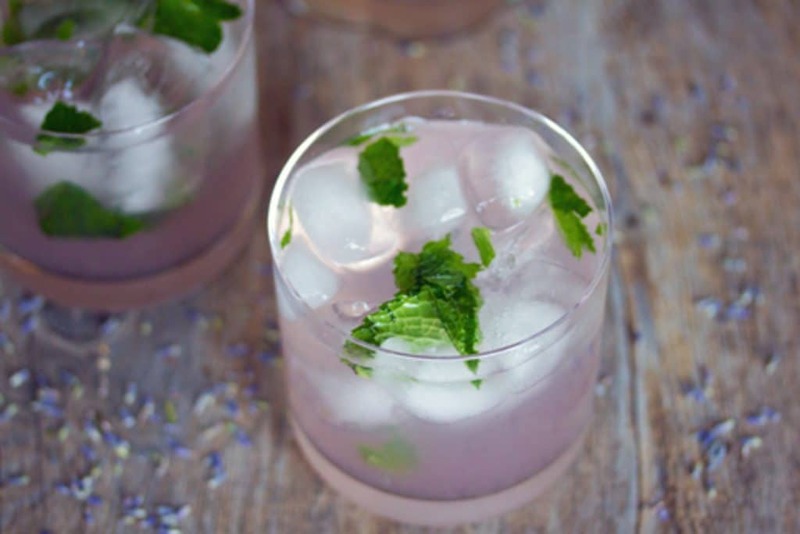 This lavender lemonade cocktail is way better than any mojito I’ve ever made. Also, did you know that yesterday was National Mojito Day? Well, it was. And it’s not too late to celebrate. It’s never a bad time to celebrate. Of course, feel free to add more rum here if you want to. Some like a little and some like a lot… take your pick. If you must, you could also enjoy this cocktail in a mocktail, alcohol-free version. I’ll be honest; I’m not even a big herbal/floral type person, but I’m in LOVE with this drink and with all of my beautiful lavender. Maybe I am becoming more of a floral fan than I previously thought. Though I think I’ll still always choose fruity and dessert-like candles and perfumes over flowery ones. The color of the drink certainly wasn’t as vibrant as some of the lavender cocktails I’ve seen, but I also have learned that some cocktails still use food coloring, even with the all-natural lavender. I think the longer you steep the lavender buds, the deeper the purple gets. Lavender, welcome to my life. A refreshing drink that’s packed with all sorts of goodness. And rum, too. Can’t forget the rum. Happy Friday! Are you a fan of lavender? For another great lavender recipe I’ve made, check out these Lavender Lemon Cookies. 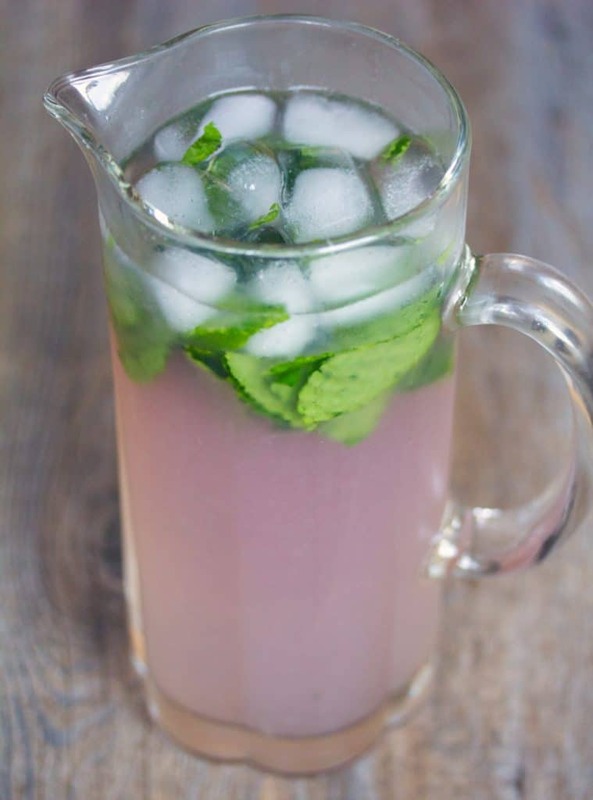 In a pitcher, muddle mint leaves with lemon juice until well combined. Add water, rum, and 3/4 cup chilled lavender simple syrup. Stir. Pour drink into ice-filled glasses. 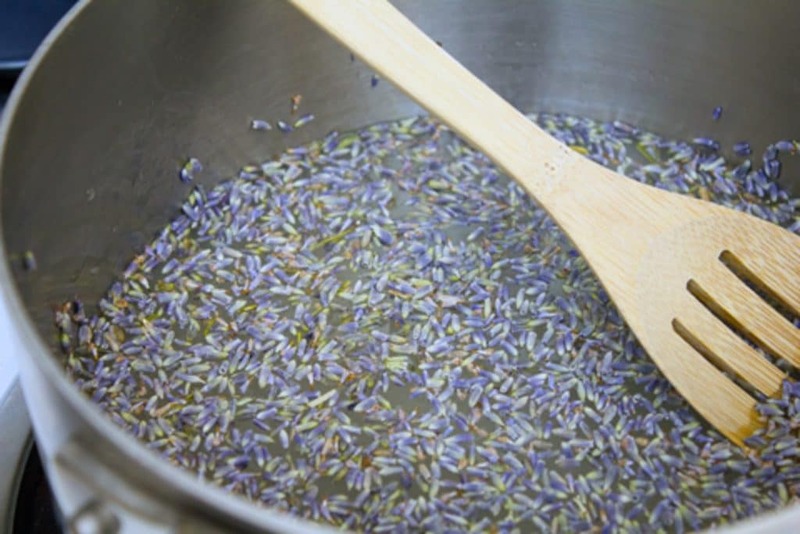 Put sugar, water, and dried lavender in a medium saucepan, stir, and bring to a boil. Once mixture comes to a boil, lower to a simmer and let simmer for about 10 minutes, until it thickens. Turn off the heat, cover the saucepan, and let steep for about an hour. 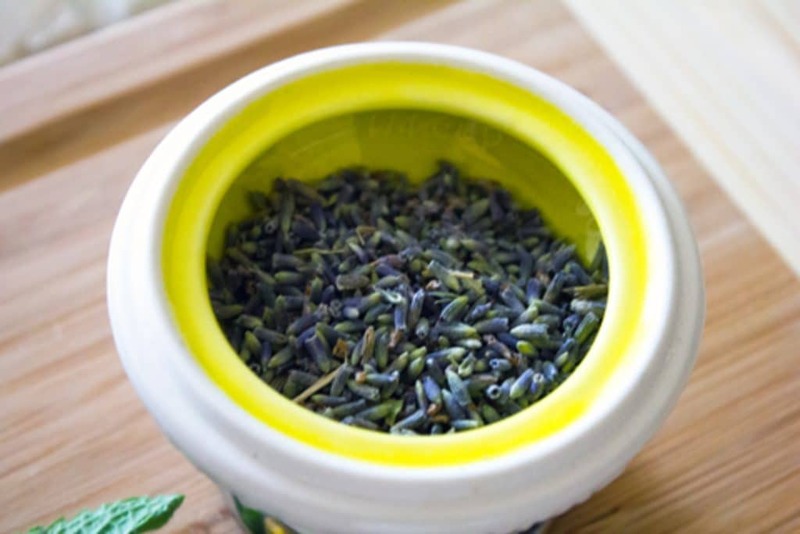 Push syrup through a mesh sieve to strain out lavender buds and into an airtight container. Place in fridge to cool. 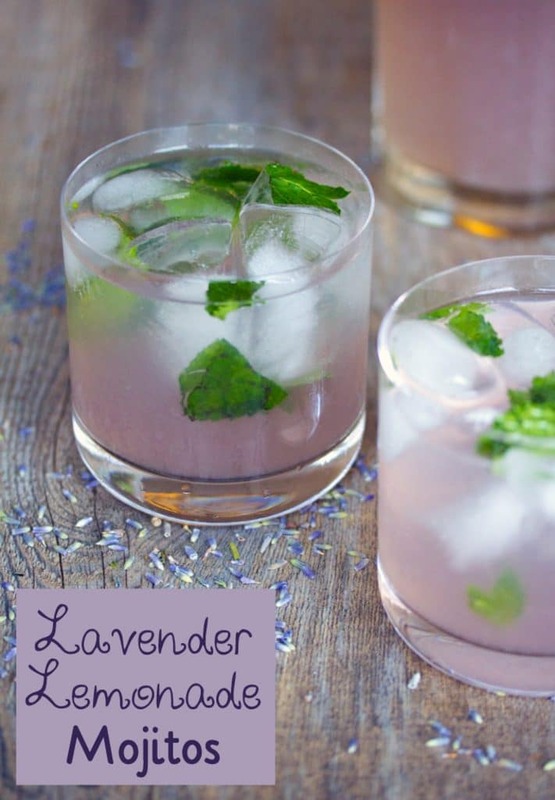 22 Responses to "Lavender Lemonade Mojitos"
Oh these are just beautiful, what a perfect refreshing summer time drink! I’ve never done ANYTHING with lavender but you’ve convinced me that perhaps I need to add some to my amazon wish list! What lovely cocktails! How pretty!! I do love lavender so I need to try this!! Love the color! This cocktails sounds perfect for vacation. This sounds amazing! Maybe I should make a pitcher for the Stella and Dot party I’m hosting next weekend! Very pretty drink! Sounds perfect for summer! Love it! I’m jealous your lavender syrup came out so much more purple than mine did… And I agree, lavender + lemon is heavenly! Especially if you add alcohol! I can’t wait to see what your next lavender creation is! Gorgeous! I need to find a good lavender source out here, I am a big fan of putting it into mixed drinks and baked goods. I loveeee lavender and it grows in bunches in my mom’s yard. I must make these. How pretty is this??? And delicious I’m sure! Sooo pretty!! Almost too pretty to drink (but who am I kidding, I would definitely drink this). I made a lavender margarita a couple summers ago, and it’s still the background of my computer! 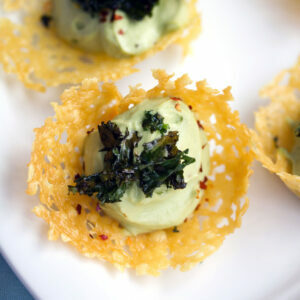 I just made an experimental batch for a small dinner party and they were a big hit! Everyone wished I had made more…. 🙂 I don’t even like lavender much, but I was given a bag of the flowers some time back. This is a delicious way to use it up! Thank you. This gets such a gorgeous pink/purple from the lavender. Such a tasty drink too!! Lavender is one of my favourite scents. I know it is a little old fashioned but I just love it. I have it in my bedroom with an essential oil diffuser. So this is just screaming…make me….make me. Plus it is so pretty!!!! I love the purple. Can the recipe in its entirety (not just the simple syrup) be made ahead of time and kept in the fridge for a couple of days? Thank you!